The Atari 2600 is a video game console. It was first released in the United States in October 1977. The Atari 2600 uses game cartridges which can be changed in and out to change games, which was a new idea in video games at the time. Before the 2600, people had to buy a different system for each game they wanted to play. Over 30 million Atari 2600 consoles were sold. While Atari designed their console, they code-named it Stella. When released in 1977, they called it the Video Computer System (VCS for short). There was also a version that was sold at Sears called the Sears Video Arcade. It was not called the Atari 2600 until the Atari 5200 released in 1982. The 2600 is called this because that is the part number the company used to tell the difference in versions. When the Atari 2600 came out, it usually came with two joystick controllers, a pair of paddle controllers, and a game cartridge. 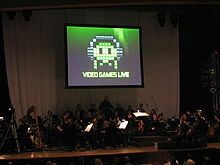 There were initially nine games available at launch, featuring Combat (packaged with the console), Air-Sea Battle, Basic Math, Blackjack, Indy 500, Star Ship, Street Racer, Surround, and Video Olympics. The 2600 originally sold for $199. In North America, the NTSC format is used, which has 128 colors. In many parts of Europe, the PAL format is used, which has 104 colors. A third format, called SECAM, was used in France; it only has 8 colors: black, blue, pink, mauve, neon green, sea-foam, yellow and white. When the Atari 2600 was released nine games were available. Those games were Combat (which came with the console), Air-Sea Battle, Basic Math, Blackjack, Indy 500, Star Ship, Street Racer, Surround, and Video Olympics. Later more games came out, including Pac-Man, Missile Command and Space Invaders. The best-selling Atari 2600 game was Pac-Man, which sold 7 million copies. Combat was chosen to be included in the box with the Atari 2600. It contained 27 games in one cartridge. Each game involved tanks, bi-planes, or jets. Space Invaders began as an intensely popular Japanese arcade game. In 1980 a version of the game was released for the Atari 2600. The pixelated aliens from this game are still used as a popular symbol for video games today. Pac-Man began as an arcade game developed by Namco. In 1982 a version was released for the Atari 2600. It sold the most copies of any game released for the Atari 2600 (7 million copies). Despite this, the game was not popular with critics and consumers, because of the major differences in gameplay between the 2600 version and the arcade version. See List of Atari 2600 Games for a bigger list of games. In 1980 the Atari 2600 was at the middle of an important development in video games, the beginning of third-party developers for console video games. In 1980 a group of four dissatisfied Atari employees founded the company Activision, who then released four games: Dragster, Fishing Derby, Checkers, and Boxing. This was an important moment in video game history as now every video game console on the market depends on some third-party game support. Today those who want to play the games designed for the 2600 do not have to try to find the original console and cartridge as many of the games have been recreated in video game emulators. One such emulator, Stella, will function on most any operating system. After downloading this emulator users can download games from other websites and use this program to play them. In 1986, a cheaper version of the Atari 2600 was released. Some people called this the Atari 2600 Junior. It was smaller than the original version. This system cost $50. This page was last changed on 2 August 2018, at 03:42.